Intuitive Web-Based Monitoring... Through the Cloud! The Sentinel system monitors up to 12 different environmental and equipment status conditions including temperature, humidity, power failure and water detection. When the system identifies issues, it instantly sends alerts via phone, text or email over a standard Internet information and make system changes from any web ‐ enabled device. The system stores all readings in the cloud, which protects against data loss, provides unlimited information storage and allows multiple devices to be managed from one account. No software is required, so installation, integration and management are easy. 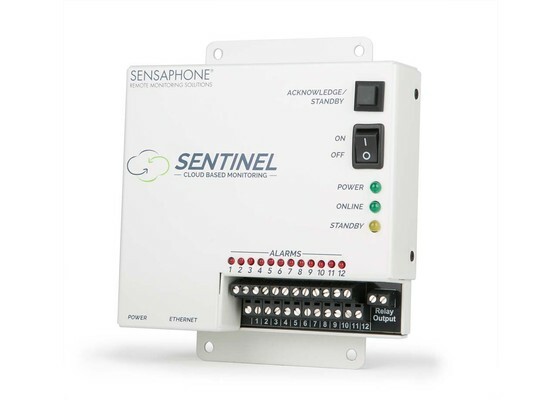 The standard Sentinel system is Ethernet based, but the product is also available with a cellular option for locations where Internet connectivity is not available.